Before we get to meet Logan, check out the blurb, and don’t forget to let me know what you think of him afterwards! Between is my (Cambria Hebert) latest Heven and Hell novella in the Heven and Hell Series. Between focuses on Logan, a character introduced at the end of the first book in the series, Masquerade. Logan is Sam’s little brother and he find Sam because he is going through some things that only Sam can help him through. 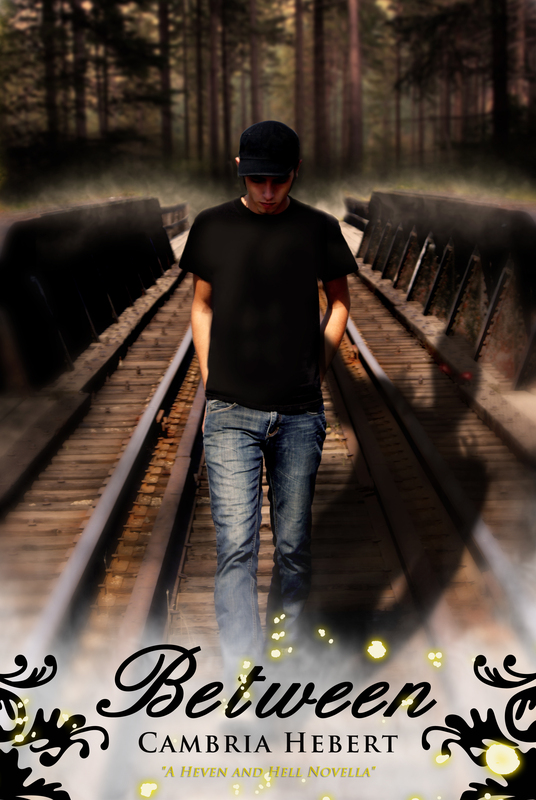 Between is a look into what world Sam left behind before he met Heven. It’s a look at his parents, his home and his brother… his brother who is beginning to change. I asked Logan if he would come here today for a brief interview and he seemed very shy. So I decided instead to give him a sheet to fill out. He seemed to like that much better. So allow me to introduce to you Logan Kavanagh the star of Between. What grade are you in: I was a freshman in high school. Before I left home. If you could be any animal what would you be: I would rather just be myself. A human. Completely human. Do you like Bubble Tea as much as Sam: I’ve never tried Bubble Tea. What do you miss most about living at home: knowing who I am and my mom’s cooking. Boxers or Briefs? Ew! I’m not answering that! Is there anyone special in your life? A girl? Umm, no. And that is Logan everyone! As part of the get to know Logan post I brought along an excerpt from Between. It’s the first two paragraphs of the novella! I kicked at the pavement as I walked, in no hurry to get home. I was glad that school was out for the day, but unlike most kids my age, I wasn’t that thrilled to go home. At least it’s Friday, I told myself, which meant no homework. That was something to be thrilled about. I hated homework. I hated studying, but if I didn’t bring home a glowing average every grading period, Dad would have a cow. Mom would try to step in and then Dad would yell at her, too, and no doubt the argument would escalate and it would end the way it always ended. He didn’t even live with us anymore, yet every single thing I did that Dad didn’t approve of somehow always came back to him. Dad never said his name. It was like the minute he left with Sam and came back without him, we were all expected to pretend he never existed. Like all the times we played football in the backyard were something I made up. I was supposed to forget the time I took Dad’s watch off his dresser to pretend I was 007 and accidently broke it. Sam took the blame, the lecture and the punishment for me. The sound of running feet came up behind me and, inwardly, I winced. You can get the full novella on its release date: April 20, 2012 from Amazon, Barnes and Nobles and Smashwords! Thanks to Tricia for hosting me and Logan today! Thank YOU for stopping by, Cambria! And thanks for bringing Mr. Shy, Logan, along as well!